Class, religion, and music mix in Suruchi Mohan's new novel. In the prologue to Suruchi Mohan's novel Divine Music, a crowd gathers on the grounds of a music school as "all of Lucknow waited for the first shower of the monsoon season." In the oppressive heat, "mosquitoes hovered over those who had styled their hair with scented oils." A celebrated singer has arrived to perform at the memorial service of her former teacher, a man who both launched her career and nearly ruined her life. Now living on the Peninsula, Mohan spent eight years studying at exactly such a conservatory, which she has fashioned into a rich fictional backdrop for this tale of two talented students from very different backgrounds who become pregnant at the hands of their mentors and face very different futures. 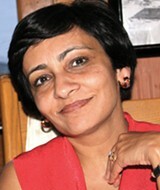 "As in all old societies, class is still a big issue in India today," she said. "It is changing, however, thanks to rapid technological development, which has given a lot more people a chance at making a good living. There is now much more social mobility than ever before," explained Mohan, who will be at the El Cerrito Library (6510 Stockton Ave., El Cerrito) on Tuesday, February 9. Along with history — it's set during the politically explosive 1970s — Divine Music offers a wealth of cultural detail; in one typical scene we meet a pundit "dressed in a white dhoti and a natural-colored silk kurta, a small red tika in the middle of his forehead," his tonsured scalp sporting "a thick choti, oiled and tied neatly into a knot." "Indian culture meant so much to me that I wanted people to understand it, flaws and all, without looking at it through a Western lens," Mohan said. "But I would be disingenuous if I said that sitting in the US I didn't think about a Western audience at all. After all, I have explained every foreign term." Early in Divine Music, we watch a widow's corpse being prepared for cremation. As female relatives drape it in a simple white shawl, "a loud male voice rang out Ram nam satya hai, shattering the air, already rent with sobs. Other males from the family joined in, producing a haunting, echoing effect that broke all dams of emotion." Music and spirituality are among the most difficult topics to write about, yet as the novel's title suggests, they intertwine to form its core; as one character observes, all boundaries between the two are blurred. At the conservatory, protagonists Sarika and Swati study Indian classical music, which Mohan compares to Gregorian chant because "they were both used in prayer, from the earliest times."